When I told my chiropractor I usually drink soy milk, he adamantly told me that soy milk is not very good for me, and suggested an alternative like almond milk. I was quite indignant, since I've been drinking soy milk all my life, and a lot of asians do too. It took some time. But, I thought, alright then, why not?? There's no harm in trying something new. 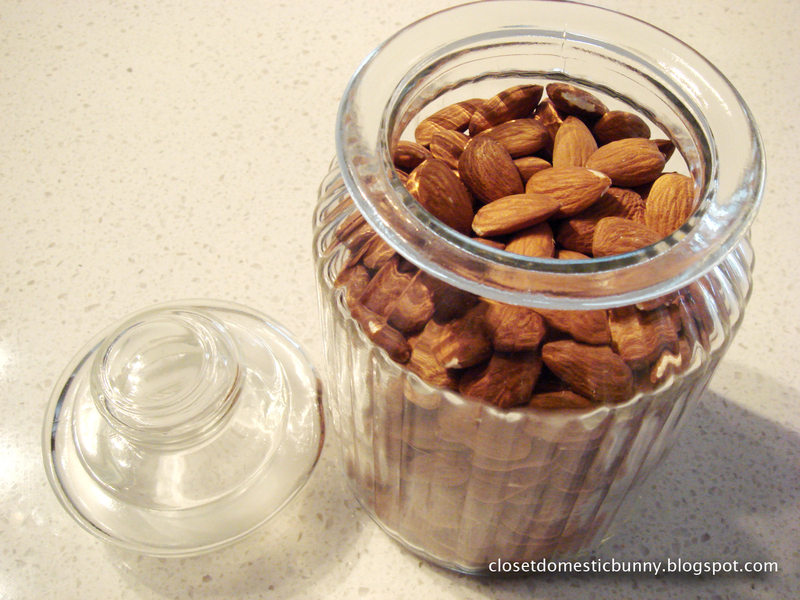 I had the almonds sitting in a jar on my kitchen bench for the longest time. You see, I don't have a blender. Hahaha.... I know, tragic, right? To make the milk I had to go to mum's place and borrow her $700 Japanese titanium blade blender. When I finally had the chance to, I used every opportunity and made three litres of the unsweetened almond milk. One litre we drank on the spot, one litre I gave to mum and dad, last litre I brought home with me. With that last litre, I made milky almond panna cotta with sweet & tart berry coulis. The berry coulis was a late addition. Halfway making the panna cotta, I realised that plain white panna cotta on a plain white plate ain't very pretty to look at. I decided to use the frozen mixed berries that have been sitting idly in my freezer for the last few months. Later on, I found out that this was a winning flavour combination. I mean if David Lebovitz think so, who am I to dispute. Making panna cotta is very easy, there's almost nothing to it. 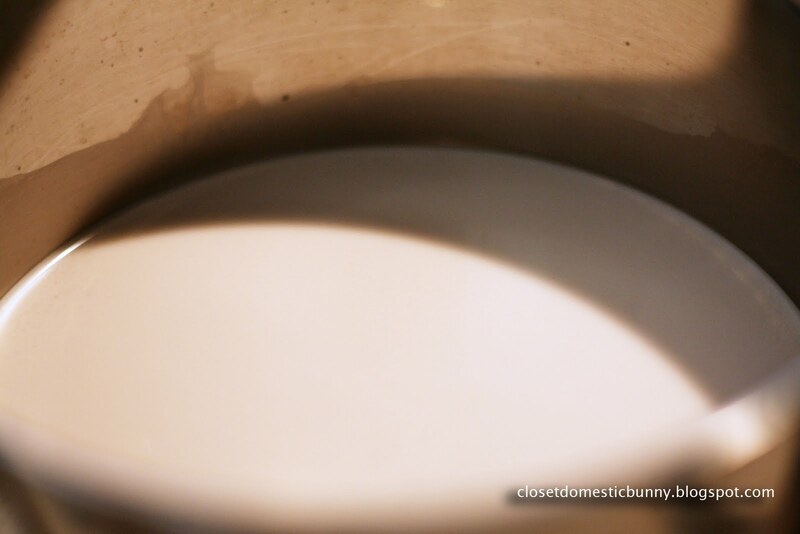 Combine the almond milk, sugar, vanilla essence and agar-agar powder into a saucepan. Heat it up until the sugar and agar-agar are dissolved. Pour the milky mixture into moulds. Set aside to cool for a bit before chilling in the fridge. 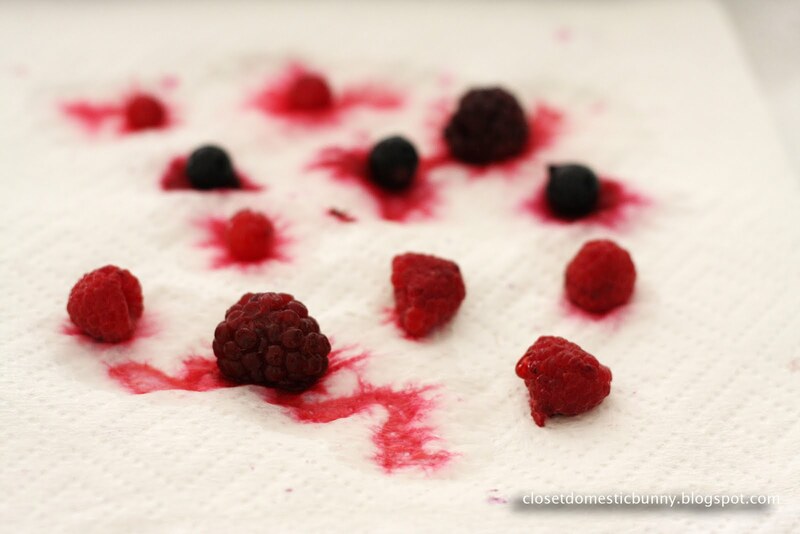 I like to plan ahead for the garnish and thaw a few of the berries on a paper towel to drain the moisture away. Learned this from an episode of Masterchef, oh yeah! Now to make the berry coulis, place the rest of the frozen berries in a saucepan and add the sugar. 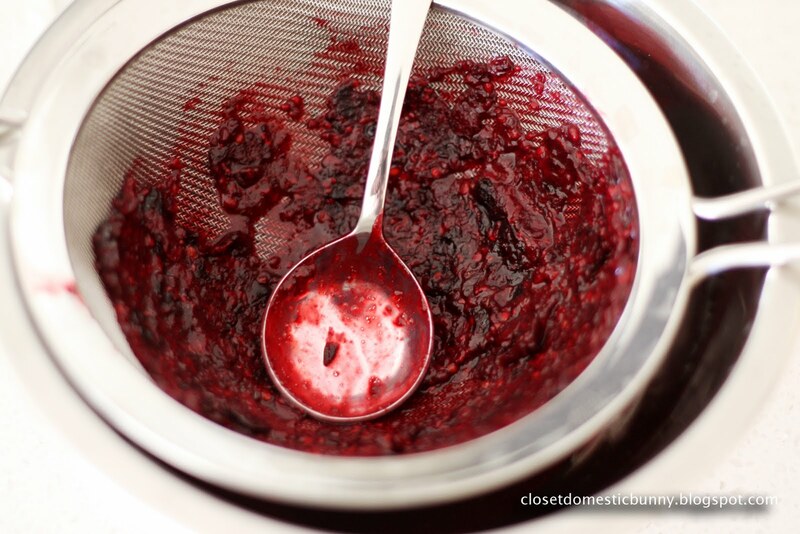 Cook on medium-low heat until berries reduce into a pulp. 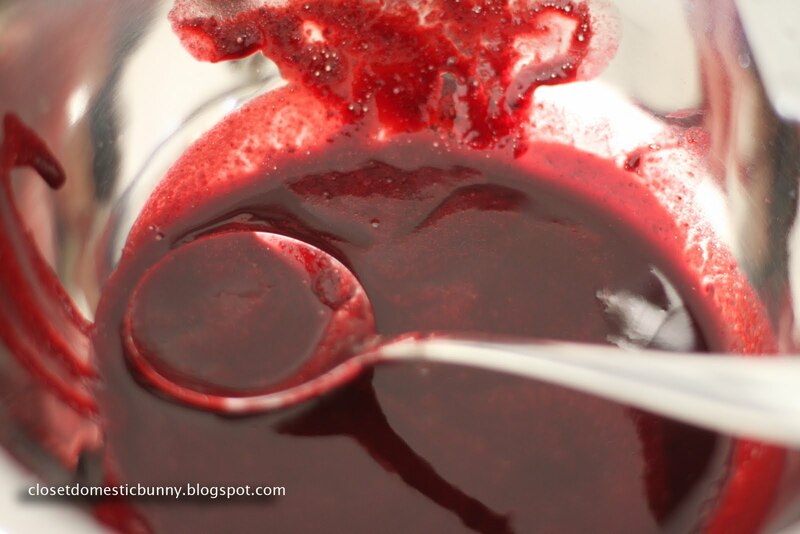 Pour the pulp into a strainer and press press press with a spoon to your heart's content. You can make the berry pulp smoother by blending it first before straining, seeing as I haven't got a blender, I skipped this step. Look at that liquid rouge goodness. I did such a chefy thing plating up by brushing the coulis on the plate with my dessert spoon. As you probably can tell, this was the first time I did this. I went a bit nuts with it and did three swooshes. May not look as professional, but it felt so satisfyingly chefy. Combine the almond panna cotta ingredients in a saucepan, cook in a medium-low heat, until all of the ingredients combined and dissolved. Remove from heat. Pour into moulds. Wait until it cools down before chilling in the fridge. 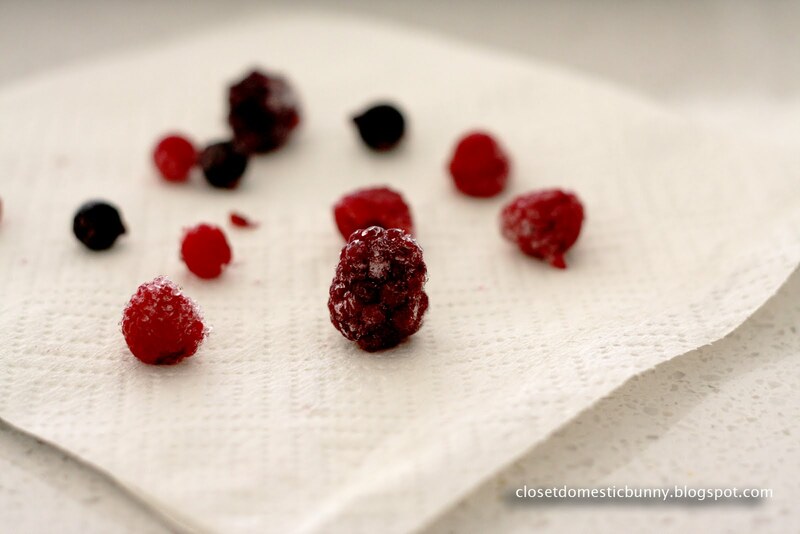 Pick a few different frozen berries to thaw on a paper towel. We'll use this later for garnish. In another saucepan, combine the berry coulis ingredients, cook in a low heat until all the berries break down into a pulp. Pour berry mixture into a blender to smooth it out. Strain with a strainer to get the berry coulis. Dress your plate however you like using the thawed berries & berry coulis. Unmould the panna cotta by running a small knife on the edges of the mould. 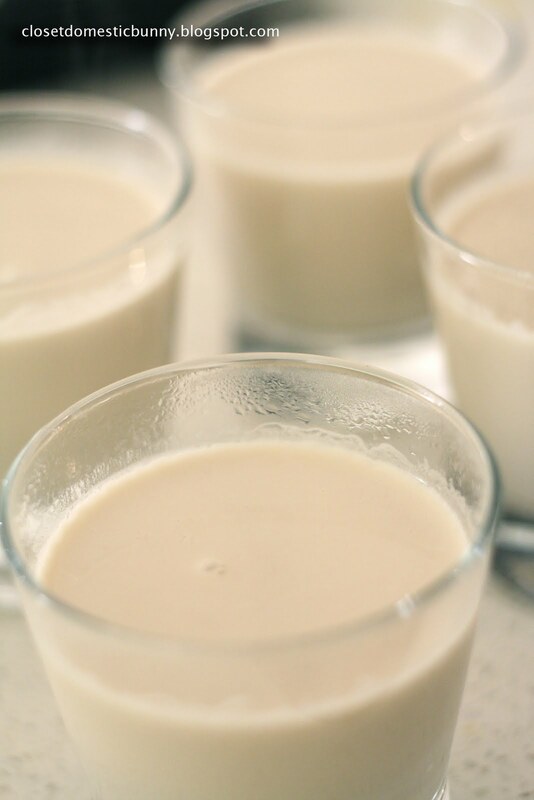 Almond milk panna cotta sounds so cool! I love the idea of the berry coulis as well. 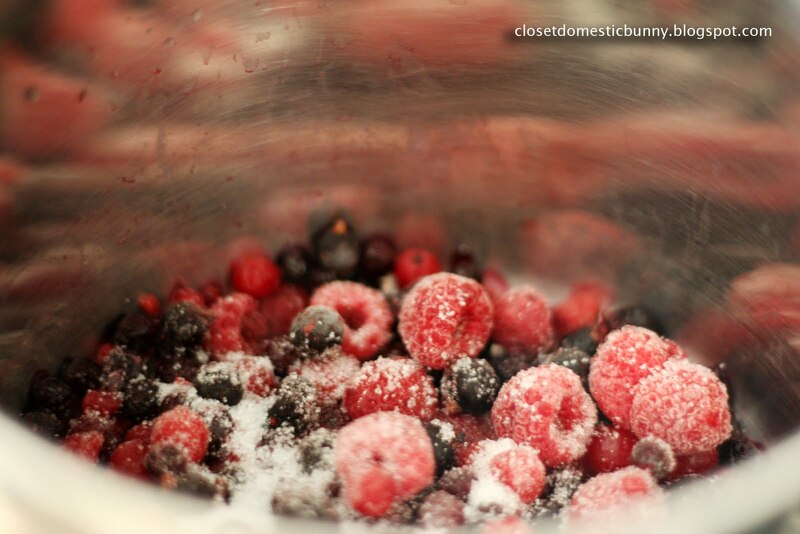 I never knew that you could drain the moisture from frozen berries and use them as a garnish. Very cool! 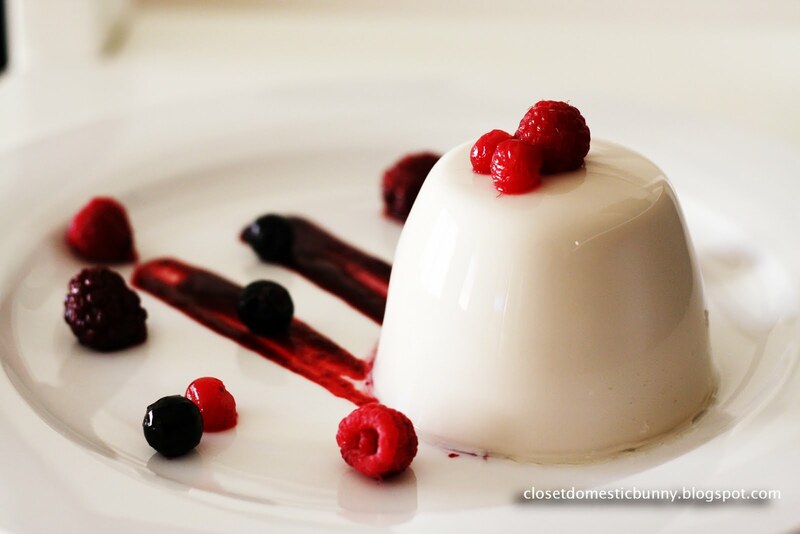 Interesting variation of the traditional Italian panna cotta. To remove the panna cotta from the mold, just place the molds in a pot of hot water for few seconds. this looks sooooo good, thanks for sharing ! 900ml sounds a lot - how many does this serve? Hi Jenny, the glasses that I used as a mould can contain up to 250mL of liquid, so for me it would be about 4 serves. It really depends on your mould. Also, you can adjust the amount of the almond milk, depending on the agar-agar powder that you are using, it will specify in the agar-agar powder packet how much liquid you should be using. Add sugar before adding the agar-agar powder and keep tasting it until you're happy with the sweetness. 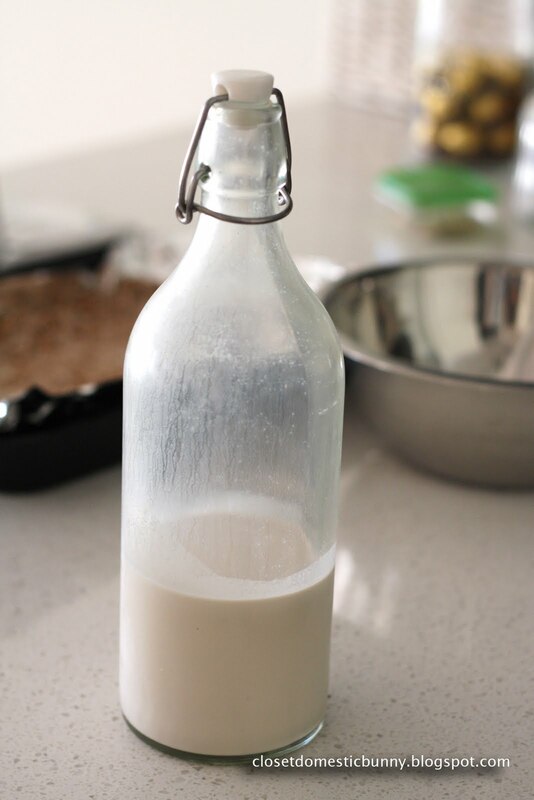 Isn't making your own almond milk great? I made my first batch a few days ago and was blown away at how much better it tastes than the variety available in stores. In other news, your panna cotta looks BEAUTIFUL! It sure is. You know exactly what goes in it, nothing but almond and water, no preservatives, no nasty stuff. I saw your beautiful Panna Cotta last night and I couldn't help but soak almonds immediately! I've prepared the almond milk now and am turning it into Panna Cotta as I type this. Veganosaurus, your words are like music to my blogger's ears, I hope you enjoyed them as much as I did. Thank you, that's so nice of you. A packet of agar agar could be any amount. Can you narrow it down a bit please? Thank you! Hi Abena, my packet of agar-agar has 7g of agar-agar powder in it, and it asked for 900mL of liquid. Hence all the measurement in the recipe. Your packet of agar-agar might have different strength and would ask you for a different amount of liquid. I'd suggest you use the measurement requested on the packet.